Bright, John D., editor. Kansas: The First Century. Four volumes. New York: Lewis Historical Publishing Co., 1956. The first two volumes concentrate on the state's history, while volumes three and four contain detailed biographical sketches. Clugston, W. G. Rascals in Democracy: A Case Study of Popular Government. New York: Richard R. Smith, 1940. In his somewhat cynical way, Clugston looks at several 20th century figures. Connelley, William E. A Standard History of Kansas and Kansans. Five volumes. Second edition. Chicago: Lewis Publishing Co., 1928. Volumes three, four, and five contain biographical sketches. Still important for the early 20th century and before. Davis, Kenneth S. Kansas: A Bicentennial History. New York: W. W. Norton & Co., Inc., 1976. The Kansas volume in the bicentennial series. Republished in 1984 as Kansas: A History. Like all the one volume histories, this one is heavy on territorial and early statehood but more interpretative than most. Raimo, John W., editor. Biographical Directory of the Governors of the United States, 1978-1983. Westport, Conn.: Meckler Publishing, 1985. Sketches of Kansas governors Bennett and Carlin are on pages 90-97. Richmond, Robert W. Kansas: Land of Contrast. Third edition. Arlington Heights, Ill.: Forum Press, 1988. Earlier editions published in 1974 and 1980. Sobel, Robert, and John Raimo W., editors. Biographical Directory of the Governors of the United States, 1789-1987. Volume two. Westport, Conn.: Meckler Books, 1978. Sketches of the first thirty-eight Kansas state governors are on pages 459-503. Socolofsky, Homer E. Kansas Governors. Lawrence: University Press of Kansas, 1990. Helpful for its statistics and biographical essays. Zornow, William Frank. Kansas: A History of the Jayhawk State. Norman: University of Oklahoma Press, 1957. Zornow's is a traditional political history approach. Admire, W. W., compiler. Political and Legislative Handbook for Kansas, 1890. Topeka, Kans. : G. W. Crane & Co., Publishers, 1891. Contains U. S. and Kansas constitutions, and election results. Argersinger, Peter H. "Ideology and Behavior: Legislative Politics and Populism." Agricultural History 58 (January 1984): 43-58. Claims that Populists were anything but conservative. __________. Populism and Politics: William Alfred Peffer and the Peoples Party. Lexington: University of Kentucky Press, 1974. Based on his dissertation done at the University of Wisconsin, 1970. __________. "Populists in Power: Public Policy and Legislative Behavior." Journal of Interdisciplinary History 18 (Summer 1987): 81-105. A roll-call vote analysis which shows that party split prevented most reform legislation. __________. "The Most Picturesque Drama: The Kansas Senatorial Election of 1891." Kansas Historical Quarterly 38 (Spring 1972): 43-64. Bewiskered Populist editor, W. A. Peffer, defeated incumbent Senator John J. Ingalls. __________. "Road to a Republican Waterloo: The Farmer's Alliance and the Election of 1890 in Kansas." Kansas Historical Quarterly 33 (Winter 1967): 443-469. Surprising victory of upstart Populists over traditionally dominant G.O.P. and its impact on politics in 1890s. Bader, Robert Smith. Prohibition in Kansas. Lawrence: University Press of Kansas, 1986. Origin, enforcement and Carry Nation, plus twentieth century developments. Baker, Floyd P. "The Kansas Legislature of 1862." Kansas Historical Collections 3 (1883-1885): 101-109. Personal recollection. Barton, D. Scott. "Party Switching and Kansas Populism." The Historian 52 (May 1990): 453-467. Ballard, David E. "The First State Legislature, 1861." Kansas Historical Collections 10 (1907-1908): 232-254. Followed by biographical sketches of members. Beals, Carleton. The Great Revolt and Its Leaders: The History of Popular American Uprisings in the 1890s. New York: Abelard-Schuman, 1968. Considerable attention to Kansas Populism, including a chapter on the "Legislative War" of 1893. "Biographies of Members of the Free State Territorial Legislature of 1857." Kansas Historical Collections 10 (1907-1908): 204-216. Brief sketches of most members of Council and House of Representatives. Caldwell, Martha B. "The Woman Suffrage Campaign of 1912." Kansas Historical Quarterly 12 (August 1943): 300-318. Kansas Equal Suffrage Association and successful campaign for equal voting rights for Kansas women. Canfield, James Hulme. History and Government of Kansas. Philadelphia: E. H. Butler & Co., 1894. Brief, major event focused history, with emphasis on state and local government. Chapman, Berlin B. 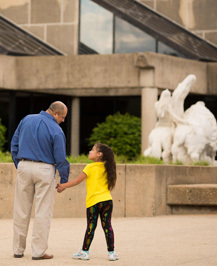 "Charles Curtis and the Kaw Reservation." Kansas Historical Quarterly 15 (November 1947): 337-352. As congressman from Kansas in 1890s, Curtis played significant role in dissolution of Kaw Reservation in Indian Territory. Clanton, O. Gene. Kansas Populism: Ideas and Men. Lawrence: University of Kansas Press, 1969. The most extensive treatment of the movement in Kansas. __________. "Populism, Progressivism, and Equality: The Kansas Paradigm." Agricultural History 51 (July 1977): 559-581. __________. "`A Rose by Any Other Name': Kansas Populism and Progressivism." Kansas Quarterly 1 (Fall 1969): 105-112. An interesting analysis of the differences between the two reform movements. __________. "Intolerant Populist? The Disaffection of Mary Elizabeth Lease." Kansas Historical Quarterly 34 (Summer 1968): 189-200. Lease broke with many other Populist leaders and helped split party over woman suffrage issue; she opposed fusion and attacked Governor Lewelling. Connelley, William E. "The East Boundary Line of Kansas." Kansas Historical Collections 11 (1909-1910): 75-80. With map of Kansas City area and discussion of long-standing dispute between Kansas and Missouri. 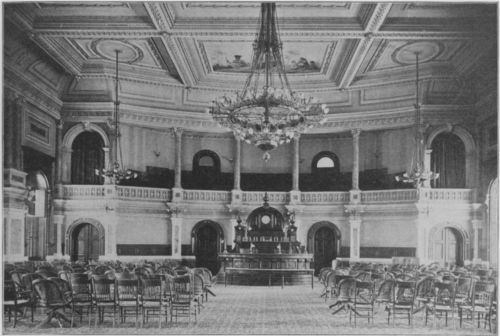 Dawson, John S. "The Legislature of 1868." Kansas Historical Collections 10 (1907-1908): 254-279. Followed by brief biographical sketches of legislators. Dykstra, Clarence Addison. The Government of Kansas. New York: Charles Scribner's Sons, 1914. Elliott, R. G. "The Big Springs Convention." Kansas Historical Collections 8 (1903-04): 362-377. First significant free-state assembly, September 1855, called to counter actions of "bogus" legislature. __________. "The Grasshopper Falls Convention and the Legislature of 1857." Kansas Historical Collections 10 (1907-08): 182-196. Includes an address delivered in December 1907 and his autobiography. Ewing, Cortez A. M. "Early Kansas Impeachments." Kansas Historical Quarterly 1 (August 1932): 307-325. Political conflict between Gov. Charles Robinson and Senator Jim Lane, and the impeachment of the former along with Secretary of State J. W. Robinson and State Auditor George S. Hillyer in 1862. __________. "Notes on Two Kansas Impeachments: Josiah Hayes, 1874, and Theodosius Botkin, 1891." Kansas Historical Quarterly 23 (Autumn 1957): 281-297. Hayes was state treasurer and Botkin was district court judge in southwest Kansas. Fisher, Glenn W. "Property Taxation in the Kansas Territory." Kansas History 11 (Autumn 1988): 185-200. Fisher, Glenn W. The Worst Tax? A History of the Property Tax in America. Lawrence: University Press of Kansas, 1996. Much attention is given to Kansas situation during the Progressive era. Frank, Thomas. "The Leviathan With Tentacles of Steel: Railroads in the Minds of Kansas Populists." Western Historical Quarterly 20 (February 1989): 37-54. Gaeddert, G. Raymond. The Birth of Kansas. Lawrence: University of Kansas Publications, 1940. The best and most complete study of the Wyandotte Convention and Constitution of 1859 and the events leading up to statehood. Gagliardo, Domenico. "Some Wage Legislation in Kansas." Kansas Historical Quarterly 8 (November 1939): 384-398. Legislative efforts to protect earnings of workers, 1880s-1910s. __________. "Development of Common and Employers' Liability Law in Kansas." Kansas Historical Quarterly 10 (May 1941): 155-174. Compensation for industrial injuries prior to adoption of Workmen's Compensation Act of 1911. Gambone, Joseph G. "Samuel C. Pomeroy and the Senatorial Election of 1861, Reconsidered." Kansas Historical Quarterly 37 (Spring 1971): 15-32. Gower, Galvin W. "Kansas Territory and Its Boundary Question: `Big Kansas' or `Little Kansas'." Kansas Historical Quarterly 33 (Spring 1967): 1-12. Pros and cons regarding this issue; former would have extended western border to Continental Divide and northern to Platte River. Hougen, Harvey R. "The Strange Career of the Kansas Hangman: A History of Capital Punishment in the Sunflower State to 1944." Doc. diss., Kansas State University, 1979. Johannsen, Robert W. "The Lecompton Constitutional Convention: An Analysis of its Membership." Kansas Historical Quarterly 23 (Autumn 1957): 225-243. Pro-slave gathering of 1857 that sparked major national debate. Kansas Constitutional Convention: A Reprint of the Proceedings and Debates of the Convention which Framed the Constitution of Kansas at Wyandotte in July, 1859. Topeka: Kansas State Printing Plant, 1920. Provides convenient access to most of the documents along with a variety of historical sketches. Kitzhaber, Albert R. "Gotterdammerung in Topeka: The Downfall of Senator Pomeroy." Kansas Historical Quarterly 18 (August 1950): 243-278. Bribery scandal (1873) that brought down Kansas senator and made him the symbol of corruption in Mark Twain's The Gilded Age. Madden, John L. "The Financing of a New Territory: The Kansas Territorial Tax Structure, 1854-1861." Kansas Historical Quarterly 35 (Summer 1969): 155-164. Madsen, Sandra A. "The 1867 Campaign for Woman Suffrage in Kansas: A Study in Rhetorical Situation." Doc. diss., University of Kansas, 1975. Martin, George W. "The Boundary Lines of Kansas." Kansas Historical Collections 11 (1909-1910): 53-74. Background and discussions that led to establishment of present borders at Wyandotte Convention of 1859. O'Brien, Patrick G. "Expansion of an American Revolutionary Ideal: Woman Suffrage in Kansas." Heritage of Kansas 10 (no. 1, 1977): 36-51. Parrish, William E. "The Great Kansas Legislative Imbroglio of 1893." Journal of the West 7 (October 1968): 471-490. 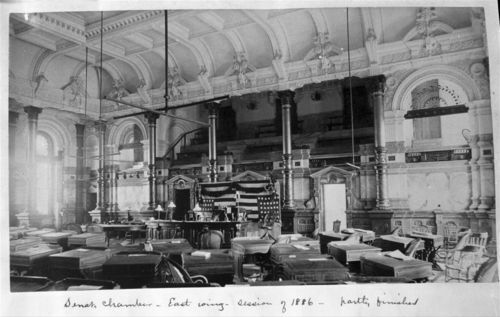 The "legislative war" of 1893. Peterson, John M. "The People's Party of Kansas: Campaigning in 1898." Kansas History 13 (Winter 1989/1990): 235-258. Press, Donald Emil. "Populist Influence on Kansas Railroads, 1890-1910." Master's thesis, University of Mo., KC., 1974. Proceedings in the Cases of the Impeachment of Charles Robinson, Governor; John W. Robinson, Secretary of State; George S. Hillyer, Auditor of State of Kansas. Lawrence, Kans. : 1862. Richmond, Robert W. "The First Capitol of Kansas." Kansas Historical Quarterly 21 (Spring 1955): 321-325. At Pawnee, near Fort Riley. __________. "Kansas Builds a Capitol." Kansas Historical Quarterly 38 (Autumn 1972): 249-267. Construction of Topeka state house spanned five decades, 1866-1903; includes 16 photos. Rickard, Louise E. "The Impact of Populism on Electoral Patterns in Kansas, 1880-1900: A Quantitative Analysis." Doc. diss., University of Kansas, 1974. Simpson, Benjamin F. "The Wyandotte Constitution." Kansas Historical Collections 2 (1875-1880): 236-247; and, 3 (1883-1885): 385-389. Reflections by the convention's youngest delegate on his fellow constitution makers and influences on the constitution. Smith, Wallace. "The Birth of Petticoat Government." American History Illustrated 19 (May 1984): 50-55. Woman suffrage in Kansas. Teacher, T. Dwight. "The Leavenworth Constitutional Convention." Kansas Historical Collections 3 (1883-1885): 5-15. Explains rationale for this convention, Kansas' third (1858). Unrau, William E. Mixed-Bloods and Tribal Dissolution: Charles Curtis and the Quest for Indian Identity. Lawrence: University Press of Kansas, 1989. The role of Curtis, an aggressive mixed blood, on national Indian policy. __________. "Charles Curtis: The Politics of Allotment." In L. G. Moses and Raymond Wilson. Indian Lives: Essays on Nineteenth and Twentieth-Century Native American Leaders. Albuquerque: University of New Mexico Press, 1985. Ware, Abby Huntington. "Dispersion of the Territorial Legislature of 1856." Kansas Historical Collections 9 (1905-1906): 540-545. U.S. army dispersed "illegal" free-state legislature meeting at Topeka; includes article written by James Redpath for Chicago Tribune, July 4, 1856. Waterbury, Ed. S. The Legislative Conspiracy in Kansas. Courts vs. Constitution. Who Are the Anarchists? Topeka: Kansas Bureau and News Co., 1893. Partisan defense of the Populist position in the "war" for control of the state legislature in 1893. Boertman, C. Stewart. "Apportionment in the Kansas House of Representatives." Emporia State Research Studies 1 (December 1952): 5-15. Bowers, John H. The Kansas Court of Industrial Relations: The Philosophy and History of the Court. Chicago: McClurg, 1922. Dole, Bob, and Elizabeth Dole, with Richard Norton Smith. The Doles, Unlimited Partners. New York: Simon & Schuster, 1988. First chapter on the "Doles of Russell." Drury, James W. The Government of Kansas. Third edition. Lawrence: The Regents Press of Kansas, 1980. First edition, 1961; and revised edition, 1970; by University of Kansas Press. Duram, James C. "Constitutional Conservatism: The Kansas Press and the New Deal Era as a Case Study." Kansas Historical Quarterly 43 (Winter 1977): 432-447. Examines editorial attitudes regarding business-government relationship in 46 Kansas newspapers during 1934-1935; expressions of economic conservatism (opposition to New Deal) were not unique to West--like other regions, many editors opposed what they saw as dangerous expansion of welfare state. Echo-Hawk, Walter, and Roger Echo-Hawk. Battlefields and Burial Grounds, The Indian Struggle to Protect Ancestral Graves in the United States. Minneapolis, Minn.: Lerner Publications, 1993. Includes the closure of the Prehistoric Indian Burial Pit at Salina and comments on Kansas' reburial legislation. Fasse, William Roberts. "Truth-in-lending in Kansas." Master's thesis, Kansas State University, 1970. Flentje, H. Edward. "The Legislative System: A Kansas Case." Doc. diss., University of Kansas, 1970. A study of the 1965 House of Representatives. __________, editor. Selected Papers of Governor Robert F. Bennett. Wichita, Kans. : Center for Urban Studies, 1979. Gagliardo, Domenico. "Development of Common and Employers' Liability Law in Kansas." Kansas Historical Quarterly 10 (May 1941): 155-174. __________. "The First Kansas Workmen's Compensation Law." Kansas Historical Quarterly 9 (November 1940): 384-397. Kansas among first states to pass such legislation (1911) despite lack of agitation for this type of law; labor here actually more interested in improved employers' liability law. __________. 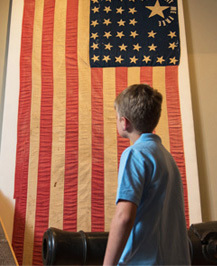 "A History of Kansas Child-Labor Legislation." Kansas Historical Quarterly 1 (August 1932): 379-401. Development and administration from their earliest origins in 1850s, with focus on "Progressive Era." __________. The Kansas Industrial Court. Lawrence: University of Kansas Press, 1941. History of Governor Allen's short-lived agency for providing compulsory arbitration of labor-management disputes. __________. "Some Wage Legislation in Kansas." Kansas Historical Quarterly 8 (November 1939): 384-398. Gorsky, Edwin L. "A Campaign Study of the Rhetoric of the 1970 `Liquor by the Drink Amendment' in Kansas." Master's thesis, University of Kansas, 1972. Grant, Philip A., Jr. "Kansas and the Woman Suffrage Amendment, 1917-1919." Heritage of the Great Plains 19 (Fall 1986): 1-18. Grigsby, Carole Marguerite. "Garnishment in Kansas." Master's thesis, Kansas State University, 1971. Harder, Marvin. The Governor of Kansas: An Analysis of Decision-Making Opportunities, Constraints and Resources. Topeka: Capitol Complex Center, University of Kansas, 1981. __________. Electoral Politics in Kansas. A Historical Perspective. Topeka: Capitol Complex Center, University of Kansas, 1983. __________, and Carolyn Rampey. 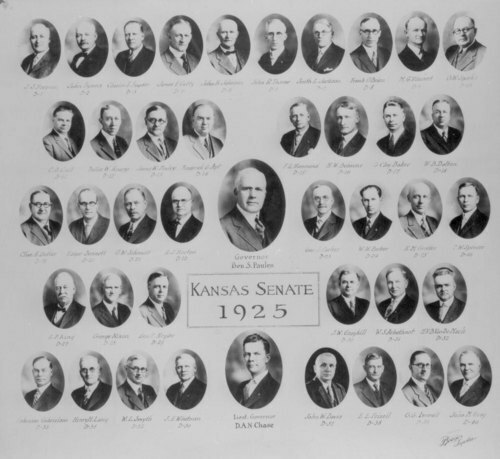 The Kansas Legislature: Procedures, Personalities, and Problems. Lawrence: University Press of Kansas, 1972. __________, and Raymond G. Davis. The Legislature as an Organization: A Study of the Kansas Legislature. Lawrence: Regents Press of Kansas, 1979. Hilton, Stanley G. Bob Dole: American Political Phoenix. Chicago: Contemporary Books, 1988. Emphasis on Dole's political career, leadership role in the U. S. Senate, and presidential aspirations, but includes significant coverage of early life in Russell and World War II experience. Jones, Phillip E. "Civil Rights and Liberties in Kansas: A Summary of Legislative and Judicial Action in the Fields of Equal Rights, Religious Liberty, and Liberty of Speech and Press." Master's thesis, University of Kansas, 1958. Nearly half of the study is devoted to racial issues, including the Kansas Antidiscrimination Commission of the 1950s. LaForte, Robert S. Leadership of Reform: Progressive Republicans in Kansas, 1900-1916. Lawrence: University Press of Kansas, 1974. Loomis, Burdett A. Time, Politics, and Policies: A Legislative Year. Lawrence: University Press of Kansas, 1994. An analysis of a year (May 1988 to May 1989) in the life of the Kansas legislature, with reference to long-term trends. Lujan, Herman D. "The Demographic Basis of Kansas Republicanism." Rocky Mountain Social Science Journal 6 (October 1969): 82-90. County study of voting patterns in state and national elections, 1958-1964. __________. Kansas Votes: National and Statewide General Elections, 1958-1964. Lawrence: Government Research Center, University of Kansas, 1965. McCoy, Donald R. "Alfred M. Landon, and the Oil Troubles of 1930-'32." Kansas Historical Quarterly 31 (Summer 1965): 113-137. Governor Landon's biographer examines state's contribution toward "achieving more effective oil regulation." __________. "Fifty Years On: The Politics of Kansas in 1932." Kansas History 6 (Spring 1983): 2-28. __________. Landon of Kansas. Lincoln: University of Nebraska Press, 1966. __________. "The New Deal Through Alf Landon's Eyes." Midwest Quarterly 6 (October 1964): 59-74. O'Brien, Patrick G., and Kenneth J. Peak. Kansas Bootleggers. Manhattan, Kans. : Sunflower University Press, 1991. Prohibition and illegal manufacture and sale of liquor from 1854-1948 with focus on region known as "the Balkans" (Crawford and Cherokee counties) because of its ethnic diversity. O'Brien, Patrick G. "Prohibition and the Kansas Progressive Example." Great Plains Quarterly 7 (Fall 1987): 219-231. Paddock, Joel Wesley. "Partisan Deviation and the Transformation of the Political Agenda: Kansas Politics, 1930-1936." Master's thesis, University of Kansas, 1982. Pankratz, Herbert. "Suppression of Alleged Disloyalty in Kansas During World War I." Kansas Historical Quarterly 42 (Autumn 1976): 277-307. Because it seemed like a national necessity, various public and private attacks on those who refused to contribute to war effort were supported or at least tolerated. Schruben, Francis W. Kansas In Turmoil, 1930-1936. Columbia: University of Missouri Press, 1969. Concentrates on the politics of the depression years. __________. "The Kansas Refinery Law of 1905." Kansas Historical Quarterly 34 (Autumn 1968): 299-324. Culmination of Progressive attack on Standard Oil monopoly, included "revolutionary" provision for state oil refinery; received national attention. Schuyler, Michael W. "The Federal Drought Relief Act in Kansas, 1934." Kansas Historical Quarterly 42 (Winter 1976): 403-424. Kansas played significant role in shaping relief activities and thus future directions of New Deal. Sloan, Charles William, Jr. "Kansas Battles the Invisible Empire: The Legal Ouster of the KKK From Kansas, 1922-1927." Kansas Historical Quarterly 40 (Autumn 1974): 393-409. __________. "The Legal Ouster of the Ku Klux Klan From Kansas, 1922-1927." Master's thesis, Wichita State University, 1970. Smith, Rhoten A., and Clarence J. Hein. "Republican Primary Fights: A Study in Factionalism." Case Studies in Practical Politics. N.p. Henry Holt & Co., Inc., 1958. Concerned with Gov. Fred Hall's unsuccessful bid for renomination in 1956. Smith, Wilda M. "A Half Century of Struggle: Gaining Woman Suffrage in Kansas." Kansas History 4 (Summer 1981): 74-95. Socolofsky, Homer E. Arthur Capper: Publisher, Politician and Philanthropist. Lawrence: University of Kansas Press, 1962. __________. "Arthur Capper: Vote-Getter, Par Excellence." Journal of the West 13 (October 1974): 26-39.